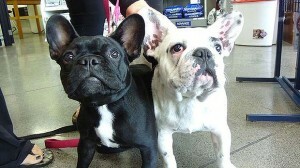 Home-alone French bulldogs Stella and Stuart sparked a medical emergency after chewing through their owner’s prescription pills and chomping on a St John medic alert panic button. Paramedics tuned up at an Orewa house north of Auckland after the alarm was triggered and knocked on the door several times with no response. They jumped a fence and rapped on windows, but still nothing. They eventually broke into the house and found the dogs – apparently none the worse for wear. Stella had pills in her mouth and Stuart had activated the panic button 12 times. Their owners arrived home to find the paramedics inside their house and took the animals to the vet once they realised what had happened. ”We gave them an intestinal absorbent to try and mop up any drugs left over,” Orewa Beach Vet Clinic veterinarian Matt Gumbrell says. “One of the medications was Warfarin (blood thinner), but a blood test has shown the dogs were not in danger,” Gumbrell says. The dogs have fully recovered from their ordeal. Both are five-months-old and at the worst part of their ‘naughty stage’. Gumbrell says he regularly treats dogs that have swallowed their owner’s pills. Huge relief that both dogs made it out of the situation unharmed. Glad to read about an emergency with a positive outcome!